Added on 12 July 2017 . By Katie Houghton. Is it a bird? Is it a plane? Is it brunch? Is it lunch? 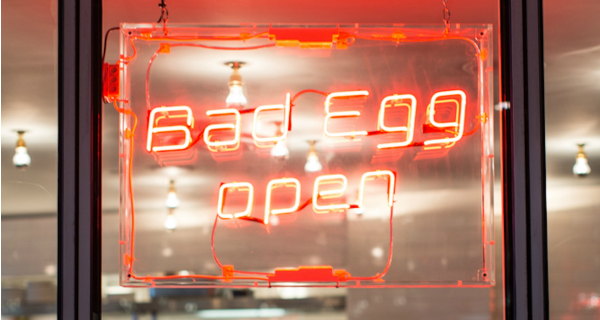 Unveiling a bottomless Friday that could compete with some of London's best Sunday brunches, Bad Egg is a devious diner in the City that's taking the boozy rights of brunch, and handing it back over to lunch. Available from 2:30 to 11pm on a Friday night, this 'Frunch' hybrid serving has all the guts of a bottomless brunch with a burger bite. So, as someone whose relationship most likely only stems from the behaviour found at bottomless brunches, we wanted to see how playing with the modus operandus could actually work. And work, it did. While it may have been the only vegetarian option on the hunking menu (one of fried chicken burgers and cheeseburger hash galore), our mac and cheese bun was like Sasha Velour, and that's something else entirely. Made up of deep fried macaroni parcels, pickles and chipotle mayo, this is a bun with a heated grip whose intensity is cut through by the silky mac like a hot knife on butter. But it's not just the bun, hun; it's the bottomless drinks option that clearly brings in the tide, and we found out why. While prosecco is a given at these sorts of thing, I don't know many bottomless drinks in London that champion the frozen margarita the way they should. Perfect alongside the fervour of the chipotle, ours were sweet,they were sour and they were perfectly fitting for a balmy, Friday evening. The Bad Egg 'Frunch' is served from 2.30pm to 11pm every Friday. Only available for the whole table with guests receiving 2 hours of bottomless drinks. Price: £32 including bottomless drinks (prosecco, frozen margarita or mimosa), a burger and a side.